Will Eating Ice Cream for Breakfast Really Make You Smarter? Why bother with overnight oats when according to a recent study, you should be eating ice cream for breakfast? The study, done by Japanese scientist Yoshihiko Koga, says eating "ice-cold food" for breakfast boosts mental performance and increases alertness. Though it seems like a cold shower could probably get the job done, I've seen too many balanced-breakfast commercials to believe eating two scoops of mint chocolate chip before heading out the door is the answer. But milk, one of ice cream's main ingredients, has long been considered (and debated to be) the perfect food—there's even a book chronicling its status as such. And isn't ice cream just a sugar-laden smoothie melted down? 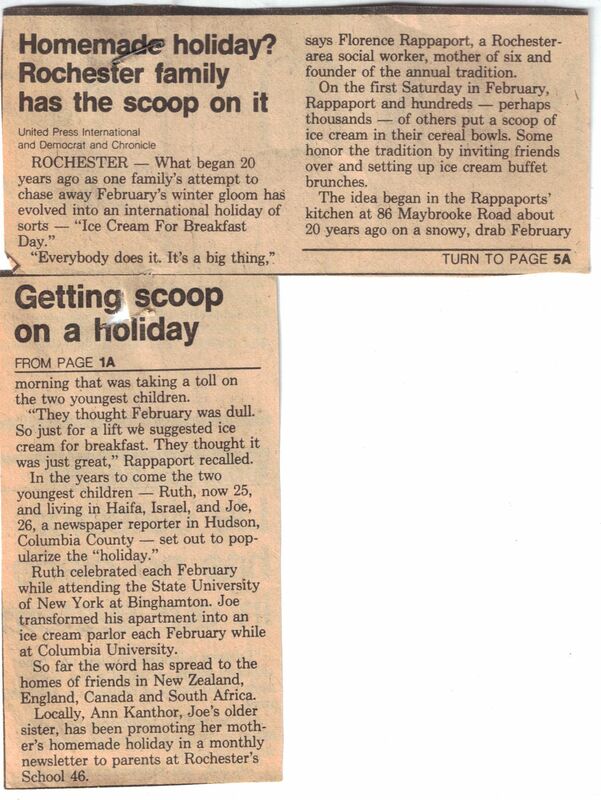 There's even been a national holiday for ice cream since the 1960s, long before science made its way into the conversation. If you've been rolling your eyes for the past five minutes, I don't blame you. Neither would Business Insider, which points out why this isn't such a great idea. The study is definitely incomplete, probably biased (it was run by a dessert company) and untrackable online. Despite all this, I have decided to spend a workweek flipping off every mealtime convention thrown at me for the last quarter century. If it makes me "smarter," great. And if my health teeters for a mere five days, that's a demerit I'll happily take. I'm not naive enough to think it could drastically improve my intelligence, but this is one experiment I'm willing to try. Day 1: I've always wondered why Morgenstern's opens so early. Granted, it has a full coffee bar, but who's actually getting ice cream at 8 a.m.? In this case, I am, but despite an otherwise-empty shop, the counter person is unphased—almost disappointingly so. I walk to work enjoying my sunflower seed ice cream and receive few incredulous looks. This reminds me how thankful I am to live in New York City. Day 2: I'm running late, so I rely on whatever we have stashed in the office freezer, which happens to be Ben & Jerry's newest nondairy flavors. I hesitate for a moment over whether this still counts as ice cream, but since the study's (only) parameter seems to mean any "ice-cold food," I happily launch into a three-for-one morning. The hype is VERY REAL right now. New @benandjerrys nondairy flavors!! Just in time for lunch. #freezermeals #? Day 3: The Milk Bar near my apartment opens at 9 a.m., so at the risk of seeming like a tourist, I aim to be the first customer. I'm welcomed with an encouraging smile, zero judgment and a cup of Crack Pie soft-serve. I go on to have ice cream for lunch as well, which either messes with my "experiment" or turns me into Albert Einstein. Day 4: I take advantage of living in Little Italy and start my day with pistachio gelato. Again, not technically ice cream, but I wasn't exactly approaching this week with a lab coat on. Day 5: The week ends with a bang—and 40 cakes in the office, which I top with Ice & Vice's Opium Den. It's a lemon-hinted sesame and poppy seed flavor, so I basically eat a bagel. The results: Am I any smarter? Probably not. I took various "intelligence tests" online—one of which was called Am I Dumb?—and they were just as surprisingly hard after the experiment as before. But whether it was the sugary jolt or the sheer adrenaline of dessert for breakfast, I felt great every morning. I'd say don't try this at home . . . but I'd be lying. Live a little.